One of the biggest benefits of Lambda functions is that they isolate you from the underlying infrastructure. While that makes it easy to deploy and manage your code, it’s critical to have a clearly defined approach for testing, debugging, and diagnosing problems. This post demonstrates the approach by creating a simple Lambda function that can be called from a gateway created by Amazon API Gateway and which returns the current UTC time. The post shows you how to design your code to allow for easy debugging, logging and tracing. One of the easiest ways to create a .NET Core Lambda function is to use the .NET Core CLI and create a solution using the Lambda Empty Serverless template. One of the key principles to effective unit testing is ensuring that units of functionality can be tested in isolation. It’s good practice to de-couple the Lambda function’s actual business logic from the plumbing code that handles the actual Lambda requests. Then, create a new TimeProcessor.cs file in the src/DebuggingExample folder. The file contains a concrete class implementing the interface. First, an instance of the TimeProcessor class is instantiated, and a Get() method is then defined to act as the entry point to the Lambda function. By default, .NET Core Lambda function handlers expect their input in a Stream. This can be overridden by declaring a customer serializer, and then defining the handler’s method signature using a custom request and response type. Because the project was created using the serverless.EmptyServerless template, it already overrides the default behavior. It does this by including a using reference to Amazon.Lambda.APIGatewayEvents and then declaring a custom serializer. For more information about using custom serializers in .NET, see the AWS Lambda for .NET Core repository on GitHub. The optional ILambdaContext parameter contains details of the execution context. The Get() method calls CurrentTimeUTC() to retrieve the time from the business logic. Finally, the result from CurrentTimeUTC() is passed to the CreateResponse() method, which converts the result into an APIGatewayResponse object to be returned to the caller. Unit testing is a great start for testing thin slices of functionality. But to test that your API Gateway and Lambda function integrate with each other, you can test locally by using the AWS SAM CLI, installed as described in the AWS Lambda Developer Guide. Unlike unit testing, which allows you to test functions in isolation outside of their runtime environment, the AWS SAM CLI executes your code in a locally hosted Docker container. It can also simulate a locally hosted API gateway proxy, allowing you to run component integration tests. Description: "API Gateway endpoint URL for Prod stage for Debugging Example function"
Description: "Debugging Example Lambda Function ARN"
Description: "Implicit IAM Role created for Debugging Example function"
The first time that you run it, it might take some time to pull down the container image in which to host the Lambda function. After you’ve invoked it one time, the container image is cached locally, and execution speeds up. If you now navigate to http://127.0.0.1:3000/ in your browser, you can get the API gateway to send a request to your locally hosted Lambda function. See the results in your browser. Having a test strategy allows you to execute, test, and debug Lambda functions. After you’ve deployed your functions to AWS, you must still log what the functions are doing so that you can monitor their behavior. The easiest way to add logging to your Lambda functions is to add code that writes events to CloudWatch. To do this, add a new method, LogMessage(), to the src/DebuggingExample/Function.cs file. This takes in the context object from the Lambda function’s Get() method, and sends a message to CloudWatch by calling the context object’s Logger.Logline() method. 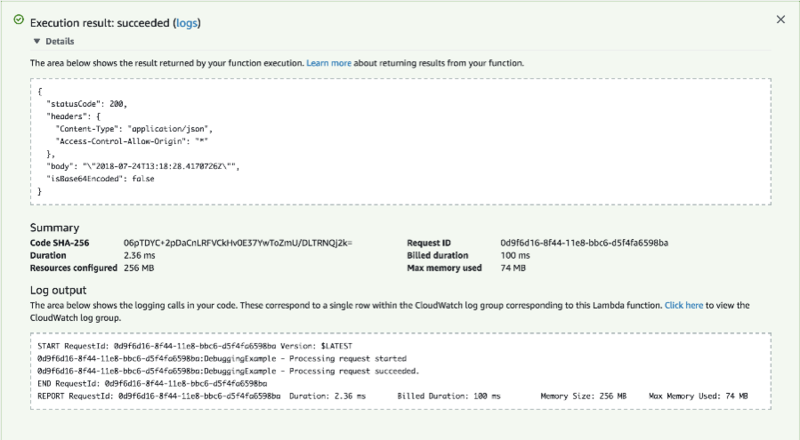 You can now add calls to LogMessage in the Get() method to log events in CloudWatch. It’s also a good idea to add a Try… Catch… block to ensure that exceptions are logged as well. Your code now logs events in CloudWatch, which provides a solid mechanism to help monitor and diagnose problems. However, it can also be useful to trace your Lambda function’s execution to help diagnose performance or connectivity issues, especially if it’s called by or calling other services. X-Ray provides a variety of features to help analyze and trace code execution. Add a new method to the Function class, which takes a function and name and then records an X-Ray subsegment to trace the execution of the function. For more information about using X-Ray from .NET Core, see the AWS X-Ray Developer Guide. For information about adding support for X-Ray in Visual Studio, see the New AWS X-Ray .NET Core Support post. Having created your Lambda function and tested it locally, you’re now ready to package and deploy your code. First of all you need an Amazon S3 bucket to deploy the code into. If you don’t already have one, create a suitable S3 bucket. You can now package the .NET Lambda Function and copy it to Amazon S3. Having run the Lambda function, you can now monitor its behavior by logging in to the AWS Management Console and then navigating to CloudWatch Logs. You can now click on the /aws/lambda/DebuggingExample log group to view all the recorded log streams for your Lambda function. If you open one of the log streams, you see the various messages recorded for the Lambda function, including the two events explicitly logged from within the Get() method. To review the logs locally, you can also use the AWS SAM CLI to retrieve CloudWatch logs and then display them in your terminal. As a final alternative, you can also execute the Lambda function by choosing Test on the Lambda console. The execution results are displayed in the Log output section. In the X-Ray console, the Service Map page shows a map of the Lambda function’s connections. Your Lambda function is essentially standalone. However, the Service Map page can be critical in helping to understand performance issues when a Lambda function is connected with a number of other services. If you open the Traces screen, the trace list showing all the trace results that it’s recorded. Open one of the traces to see a breakdown of the Lambda function performance. In this post, I showed you how to develop Lambda functions in .NET Core, how unit tests can be used, how to use the AWS SAM CLI for local integration tests, how CloudWatch can be used for logging and monitoring events, and finally how to use X-Ray to trace Lambda function execution. Put together, these techniques provide a solid foundation to help you debug and diagnose your Lambda functions effectively. Explore each of the services further, because when it comes to production workloads, great diagnosis is key to providing a great and uninterrupted customer experience.